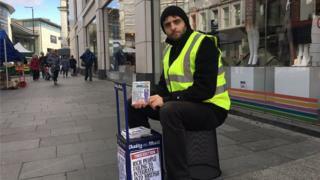 Image caption Mr Cullen said the Mail was an "anti-immigration, homophobic paper"
A political artist has been handing out fake mini-copies of the Daily Mail in Liverpool. Darren Cullen was commissioned by Culture Liverpool for the project, which is asking people to take a different look at news. He produced miniature versions of the newspaper which he said distilled its content to "its angry core". The BBC has approached the Daily Mail for a response, but the newspaper is yet to comment. The miniature newspapers are roughly 4in x 6in (10cm x 15cm) in size - equivalent to a quarter of the size of a sheet of A4 - and contain satirical headlines and adverts printed on paper similar to that used by tabloid newspapers. Mr Cullen, 35, has previously collaborated with the infamous artist Banksy, and abandoned a degree in advertising to study fine art at Glasgow School of Art. He said: "The Daily Mail is an anti-immigration, homophobic paper. It fear mongers and [builds people up to knock them down]. I am trying to highlight the hypocrisies of the paper." The project is part of artist hub Rapid Response Unit which has been running in the city for six months. Their website says they aim to 'put art and culture at the heart of the news agenda, and Liverpool at the heart of every story, as national and international artists respond to global events as they happen'. It is funded by Liverpool city council's cultural service as part of their 2018 programme to mark 10 years since the city was named European Capital of Culture in 2008. Paul Birchaoo, 53, from Liverpool, who picked up a copy, said: "No-one knows what to believe. I don't believe any of them; they all tell you lies. "I don't read the papers anymore. Maybe I'll hear the news on the radio, but that's it. I'm not interested." Image caption Liam Hales said he only believed something if he saw it in "lots of places"
Like many teenagers, 18-year-old Liam Hales, from Wirral, said he did not buy the newspaper but looked at its online site instead. He said: "I find out what's happening with online news, Facebook, Snapchat. I read the Daily Mail, but sometimes it's really dramatic. "I don't always believe what any news says, they always twist it don't they? I only believe something if I see it in lots of different places." The fake newspapers will be handed out for the rest of the week across the city.